Great Deals on Water Purification System Packages and Such…Coming Soon! Powerfull Water Filtration and Purification Specs. If I were to make a primitive filter using the black berkley elements, would I be able to take any type of raw water? If that doesn’t answer your question just give me a call. Thanks for the prompt response. I’m looking for some sort of emergency filtration system to have stashed away in our garage if we need it. There is a creek running through our backyard with livestock in the vicinity and id like a system that would be adequate for that purpose. Chemicals and all if necessary. 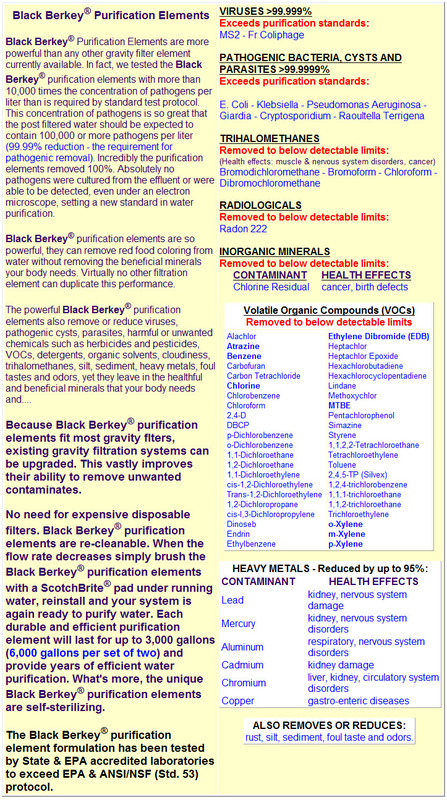 All of that said… Berkey recommends that if you suspect large amounts of “nasties” in your water that you would be well advised to treat it chemically first then let the Black Berkey Purification Elements take out the “dead bugs” and the chemicals like chlorine etc. You don’t have to do that but it might be a safety precaution worth taking.